Risk for ESRD among elderly patients with acute kidney injury (AKI) has not been studied in a large, representative sample. This study aimed to determine incidence rates and hazard ratios for developing ESRD in elderly individuals, with and without chronic kidney disease (CKD), who had AKI. In the 2000 5% random sample of Medicare beneficiaries, clinical conditions were identified using Medicare claims; ESRD treatment information was obtained from ESRD registration during 2 yr of follow-up. Our cohort of 233,803 patients were hospitalized in 2000, were aged ≥67 yr on discharge, did not have previous ESRD or AKI, and were Medicare-entitled for ≥2 yr before discharge. In this cohort, 3.1% survived to discharge with a diagnosis of AKI, and 5.3 per 1000 developed ESRD. Among patients who received treatment for ESRD, 25.2% had a previous history of AKI. After adjustment for age, gender, race, diabetes, and hypertension, the hazard ratio for developing ESRD was 41.2 (95% confidence interval [CI] 34.6 to 49.1) for patients with AKI and CKD relative to those without kidney disease, 13.0 (95% CI 10.6 to 16.0) for patients with AKI and without previous CKD, and 8.4 (95% CI 7.4 to 9.6) for patients with CKD and without AKI. In summary, elderly individuals with AKI, particularly those with previously diagnosed CKD, are at significantly increased risk for ESRD, suggesting that episodes of AKI may accelerate progression of renal disease. Although short-term consequences of acute kidney injury (AKI) have been extensively studied,1–4 the rate of development of end-stage renal disease (ESRD) after AKI has been poorly defined in a representative sample. Moreover, the potential linkage between patients with AKI, chronic kidney disease (CKD), and ESRD has been poorly studied and remains ill defined, particularly among elderly individuals, who represent the fastest growing segment of the ESRD population. Since 1972, all patients who have ESRD and are eligible for Social Security in the United States have been entitled to all Medicare benefits, regardless of age. All US renal dialysis units and transplant facilities are required to complete the Centers for Medicare & Medicaid Services (CMS) End-Stage Renal Disease Medical Evidence Report (CMS-2728) for each patient receiving initial treatment at that site. The Medical Evidence Report registers all patients who have ESRD with the US Renal Data System (USRDS), which maintains the data. Thus, patients entitled to ESRD therapy after AKI can be found in the USRDS database. The primary objective of our study was to determine the postdischarge incidence rates and hazard ratios (HR) for developing ESRD in elderly individuals who sustain AKI. A secondary objective was to assess the difference in developing ESRD between elderly individuals with and without CKD. The incidence of AKI was 3.1% and baseline CKD was present in 12.0% of the cohort in 2000 (Table 1). 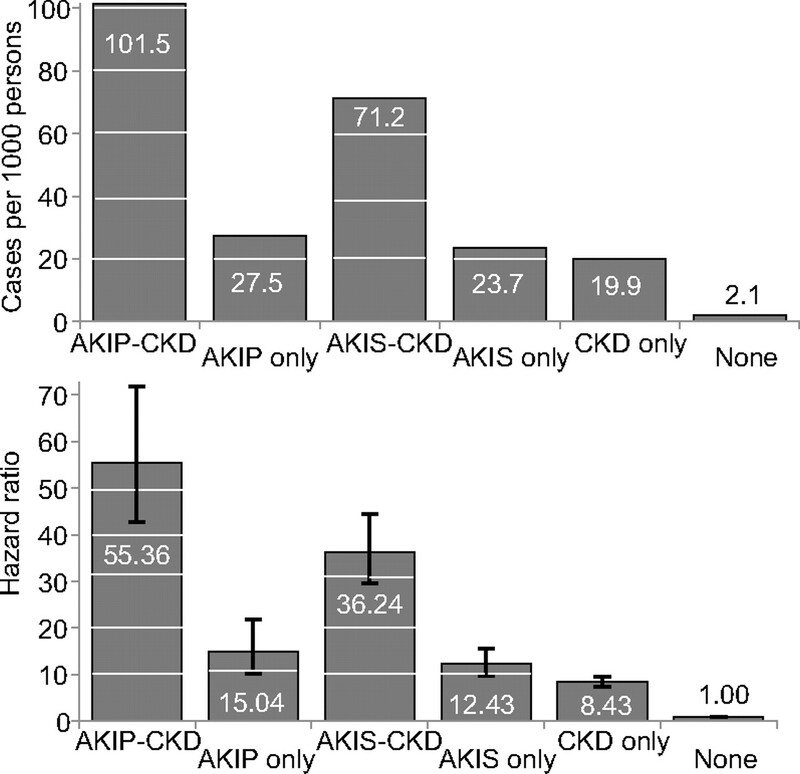 Among patients with AKI, the proportion with baseline CKD was 34.3%. Of patients who survived their index hospitalizations, those with AKI and CKD had higher 2-yr mortality than those with AKI alone (Table 2). This may represent survivor bias; of the patients who had AKI and died during the hospitalization, 64% had AKI alone, and 36% had AKI and CKD (data not shown). The likelihood of initiating ESRD treatment among patients with AKI increased steadily after discharge (Figure 1). Considering patients with AKI only (Figure 1, top), the likelihood of initiating ESRD treatment after AKI was 0.96% within 30 d, 2.69% within 180 d, 4.08% within 365 d, and 6.96% at the end of 2 yr of follow-up. The corresponding likelihoods for patients without AKI were 0.04, 0.14, 0.25, and 0.49%, respectively. Considering patients with both AKI and CKD (Figure 1, bottom), the likelihood of initiating ESRD treatment after AKI was 1.61% within 30 d, 4.76% within 180 d, 7.91% within 365 d, and 14.29% at the end of 2 yr of follow-up. Corresponding likelihoods were 0.63, 1.68, 2.28, and 3.68% for those with AKI only; 0.26, 0.86, 1.43, and 2.54% for those with CKD only; and 0.01, 0.05, 0.11, and 0.25% for those with neither AKI nor CKD. Estimated probability of initiating treatment of ESRD, using the Kaplan-Meier method. (Top) Curves by AKI status. (Bottom) Curves by AKI and CKD status. DF, degrees of freedom. Table 3 shows the number of ESRD cases and HR for development of ESRD by patient demographics and clinical conditions. When AKI and CKD were considered independently, patients with AKI were 6.74 times more likely to develop ESRD than those without injury, after adjustment for age, gender, race, diabetes, hypertension, and CKD. When AKI and CKD were considered simultaneously, patients with AKI only (HR 13.00) were approximately 54% more likely to develop ESRD than those with CKD only (HR 8.43). Patients who had CKD and sustained AKI showed a striking multiplicative effect of the interaction between the two conditions on the development of ESRD (HR 41.19), compared with patients with neither diagnosis. In patients who had CKD and had AKI coded as the principal diagnosis, the rate of developing ESRD was 101.5 per 1000 patients (Figure 2). After adjustment for age, gender, race, diabetes, and hypertension, these patients were 55.36 times more likely to develop ESRD than those with neither condition. 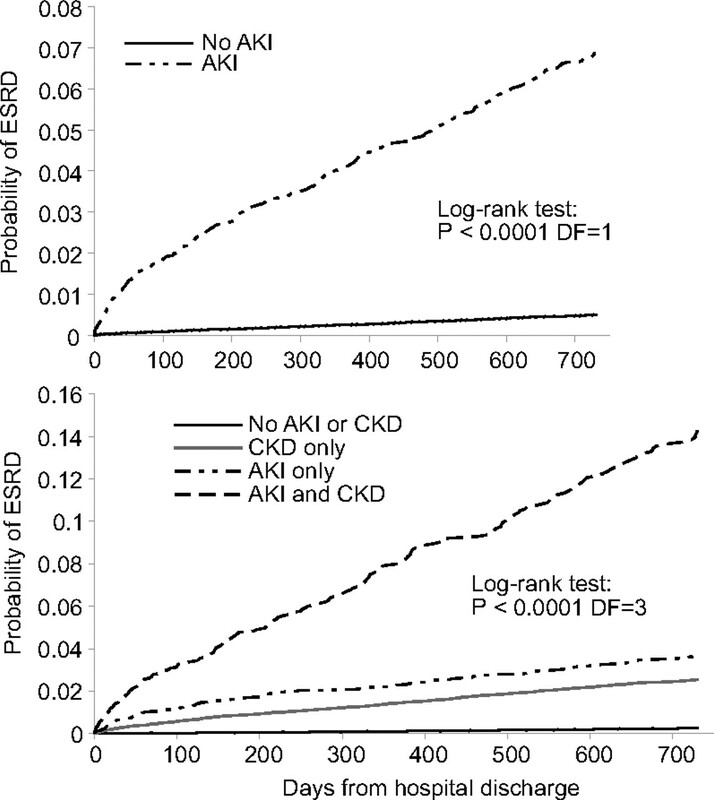 Risk for ESRD in patients with AKI coded as the principal diagnosis and without CKD (HR 15.04) was approximately 42% of the risk of those with both AKI coded as a secondary diagnosis and CKD (HR 36.24). Number of cases per 1000 persons (top) and HR (bottom) for ESRD by AKI and CKD status. AKIP, AKI coded as principal diagnosis; AKIS, AKI coded as secondary diagnosis. This study demonstrates for the first time the impact of AKI on the hazard for developing ESRD in a representative sample of Medicare beneficiaries. Initiation of ESRD treatment increased steadily after AKI occurred. Patients with both AKI and preexisting or concurrent CKD showed a multiplicative effect on risk for the development of ESRD. AKI has generally been considered self-limiting, with a good prognosis when recovery is noted in hospital.5 Results from our study suggest that among patients who had AKI and did not have recognized preexisting CKD (n = 4730), CKD was documented within 2 yr of the AKI occurrence in 72.1%. These findings suggest that CKD may be unrecognized or that AKI can initiate CKD. Several early studies in which renal clearance measures were carefully performed demonstrate that survivors of AKI may experience considerable decline in kidney function.6–8 Results from several more recent studies support these findings.9,10 A greater likelihood of initiating ESRD treatment among patients who sustain AKI has also been noted in single-center studies in which 8 to 10% of patients with AKI received long-term dialysis (>90 d).10–15 Recently, two studies using the Cooperative Cardiovascular Project suggested that AKI, after a hospitalization for myocardial infarction, was associated with both ESRD16 and mortality.17 Specifically, in the study by Newsome et al.,16 any change in serum creatinine after a myocardial infarction was associated with an increased risk for ESRD; however, both studies used the admitting serum creatinine as the baseline, possibly minimizing their observed associations. Furthermore, neither study determined whether baseline CKD modified the observed associations. Other, longer term studies have generally been limited by small sample sizes. Schiffl et al.9 conducted a 1-yr follow-up of 433 individuals with acute tubular necrosis necessitating renal replacement therapy (RRT). In that cohort, only one (0.2%) individual required RRT. Similarly, Lins et al.18 demonstrated a need for RRT at 1 yr in 13 (9.0%) of 145 survivors of AKI. Finally, in a population-based study, Bagshaw et al.19 demonstrated that 12 (26.1%) of 46 survivors of AKI required RRT at 1 yr. The finding that episodes of AKI place patients at high risk for developing ESRD may help address the ongoing high incidence of ESRD in the United States. Ecological data demonstrate that CKD prevalence is comparable for non-Hispanic white individuals in the United States and in Norway, but ESRD incidence among non-Hispanic white individuals in the United States is 2.5 times that of Norway,23 suggesting that the prevalence of CKD may not be the sole or key factor in the high incidence of ESRD in the United States. Hsu et al.24 reached a similar conclusion. After analyzing ESRD incidence data and nationally representative CKD data, these authors reported that growth of ESRD incidence substantially outpaced growth of CKD in the United States. Only approximately 10% of the growth in ESRD cases could be attributed to the increase in CKD. With individual-level data, Hsu et al.25 confirmed their previous finding that increasing prevalence of CKD is not a main factor in the high incidence of ESRD in the United States. Limitations of this study should be noted. First, the use of International Classification of Diseases, Ninth Revision, Clinical Modification (ICD-9-CM) codes may confer high specificity but low sensitivity for identifying both AKI and CKD26,27; therefore, these reported data likely are reliable but may underreport the complete impact of both AKI and CKD, especially among women and patients aged >75 yr.26 Whether the diagnostic accuracy of the codes used for AKI varies in the presence of CKD is unknown. In addition, if the specificity of codes is related to severity of disease, then more severe AKI episodes would be more likely to be documented by ICD-9 codes, potentially inflating our observed association between AKI and ESRD. Because our study relies only on diagnosis codes to define events, we are unable to determine whether severity of AKI influences the association. Furthermore, we are unable to adjust for severity of CKD in our analysis. Because more advanced CKD is a strong risk factor for AKI, as shown by Hsu et al.,28 the increased incidence of ESRD associated with AKI that we observe may be truly driven by underlying advanced CKD, with a smaller contribution by AKI. Participants in our study were aged ≥67 yr at the beginning of follow-up (and aged at least 65 yr in the baseline period), with physiologically reduced GFR and a high burden of medical comorbidity; therefore, findings from this study may not generalize to younger populations or to the US population as a whole. However, the proportion of incident ESRD patients aged ≥65 yr in the US ESRD population increased from 28.6% in 1980 to 42.2% in 1990 and 49.5% in 2000,29 and elderly patients constitute the fastest growing segment of the ESRD population. In addition, although this study emphasizes the relative importance of AKI in the development of ESRD, the overall contribution of CKD to ESRD development should not be overlooked. Our data indicate CKD prevalence was still high in 2000, at approximately 12%. In addition, approximately 57% of patients with incident ESRD included in this study had previous CKD. Finally, a large number of patients with AKI did not survive the index hospitalization and were not included in our cohort, thus minimizing our reported association between AKI and mortality; however, the objective of the study was to assess the long-term effects of AKI on renal outcomes, and inclusion of initial-stay mortality would have obscured these relationships. In summary, patients with AKI have a much higher risk for developing ESRD relative to those without AKI. CKD is frequently complicated by AKI, and patients with both conditions identified are particularly susceptible to the development of ESRD. The impact of AKI on the development of ESRD suggests that AKI may be an important factor contributing to the high incidence of ESRD in the United States. The findings from this study may be helpful in developing novel strategies to reduce the incidence of ESRD and also suggest that close medical follow-up of kidney function in elderly patients who have experienced AKI is warranted. We constructed a cohort of individuals hospitalized in 2000 with a discharge diagnosis of AKI. For the construction of this data set, we used a 5% random sample of Medicare beneficiary claims data from CMS and the ESRD incidence database from the USRDS. The ESRD incidence data set provided information on patient enrollment in the ESRD program. Patients who recovered kidney function within 180 d of ESRD initiation were classified as non-ESRD. Medicare claims data provided all other clinical and demographic information. Records of individual patients in the two databases were linked by a unique identification number developed by the USRDS. Overall, 233,803 patients were included in the study, representing 66.3% of patients in the 5% Medicare inpatient sample from 2000. Because patients were required to survive their hospitalization, we excluded patients who had AKI and died while in hospital. Medicare inpatient claims for all participants were searched for a diagnosis of AKI using ICD-9-CM codes 584.x. Specificity of coding method in AKI was previously validated by Waikar et al.26 We further categorized AKI on the basis of coding as the principal or a secondary diagnosis. Patients were followed from the date of hospital discharge until first occurrence of enrollment in the ESRD program, death, or the end of the 2-yr follow-up. We searched inpatient, outpatient, skilled nursing facility, and physician/supplier Medicare claims in the 2 yr before hospital discharge to determine the following comorbid conditions: CKD, diabetes, hypertension, and heart disease. The algorithm we used required at least one inpatient or skilled nursing facility claim or at least two outpatient or physician/supplier claims with the corresponding comorbid condition as a diagnosis code. Diagnosis codes and algorithms for these conditions have previously been validated.27,30,31 Because Hispanic, American Indian, and Asian American patients made up a small proportion of participants, they were classified as other racial group. White and black patients in this study were non-Hispanic. All data were analyzed using SAS (SAS Institute, Cary, NC). The Kaplan-Meier method was used to obtain probability curves of developing ESRD. Cox proportional hazard models were used to estimate HR for developing ESRD and death. Explanatory variables in the Cox model were age, gender, race, AKI, and the baseline conditions including CKD, diabetes, hypertension, and heart disease. For all survival models, follow-up time began at hospital discharge. Death was censored in the Cox model for developing ESRD, and ESRD was censored in the Cox model for death. The data reported here were supplied by the USRDS. This study was performed under contract HHSN267200715002C (National Institute of Diabetes and Digestive and Kidney Diseases, National Institutes of Health, Bethesda, MD). We thank USRDS colleagues Beth Forrest and Shane Nygaard for manuscript preparation and Nan Booth, MSW, MPH, for manuscript editing. See related editorial, “Yin and Yang: Acute Kidney Injury and Chronic Kidney Disease,” on pages 8–10. The Ethics of Offering Dialysis for AKI to the Older Patient: Time to Re-Evaluate?